An All-Northern League baseball and basketball star at Wilson High School, Vic Lapiner attended USC on a baseball scholarship. 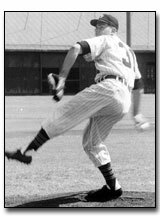 In 1955, his Trojan senior year, Lapiner was All-CIBA and All-Pacific Coast, finishing the college season with a 27-3 pitching record. Lapiner signed with the Cleveland Indians and, in his first minor league season (1956) at Redding (Class A), his 17-5--1.96 ERA record earned him MVP and Rookie of the Year honors. He spent the next two years in military service, where he was All-Navy in both baseball and basketball. Vic returned to baseball in 1959, but the minor leagues weren’t the place for a young, career-minded married man in those days. Nevertheless, he stayed close to the game, coaching part-time with the Indians for 17 years, as well as American-Legion baseball.